An alternative to the H3 tar road between Malelane and Skukuza is the S114, a dirt road that has a number of interesting detours along the Biyamiti and Bume watercourses. The road can get dusty during the dry winter months but it has less traffic, which allows for more privacy. There is usually good birding along the first few kilometres of the S114 as it tracks the Crocodile River between Malelane Gate and the Timfenheni Loop (S121) turn-off where the road leaves the river and enters the mixed bushwillow and Marula woodlands of the Mlambane drainage area. Gardenia Hide overlooks a smallish pan on the Mlambane Loop (S118), close to the junction of the Mlambane and Crocodile Rivers. The hide is named after the attractive copse of thick, old Bushveld Gardenia (Gardenia volkensii) trees at the water hole. The pan is usually dry and the birding isn't great. However, it's worth a visit in late spring or early summer when the Gardenia briefly flowers - sunbirds are seduced by the nectar-rich, fragrant, waxy, white and yellow flowers. Look out for the Three-banded Plover which regularly nests at the water's edge. Not much is known about the movements of this plover, which is often seen on sandbanks foraging for aquatic invertebrates. It employs a curious hunting technique. It stands on one leg and wiggles the toes of the other leg in the mud to draw its prey to the surface. It then catches them with a rapid pecking motion. There are also two good viewpoints from the S118 across the Mlambane River. Bateleurs nest in the vicinity, while many of the other major raptors patrol the river for prey. There is usually a fair amount of activity on the S114 to Skukuza between the Afsaal turn-off and the Biyamiti River crossing. This is where the road crosses the game-rich gabbro strip of sweetveld grazing that runs between the shallow valleys of the Biyamiti and Mlambane River systems. Lilac-breasted Rollers dominate the roadside as the S114 gently descends towards Biyamiti Weir. In summer, there are Black-bellied Bustards* in the pockets of grassland between the dense copses of woodland where small flocks of Grey Go-away-birds* fly between the trees. In bushveld lore, the Grey Go-away-bird* is often a sentinel for grazing animals, warning them of impending danger with its loud, rasping 'go away' call. It moves through the woodland following the tree-fruiting season. It is particularly fond of Marula fruit and Sycamore Figs. It's common throughout Kruger with an estimated population in the Park of about 65 000 adults. Biyamiti Weir is a good place to stop as there is usually something interesting going on in the reeds along the river bank. The African Hawk-Eagle, recognisable by its white chest and underwings, often circles overhead, while Red-breasted Swallows dip over the river. This common summer visitor often nests in culverts along Kruger's roads. There is an old Marula tree on the southern side of the Biyamiti crossing that has hosted a Hamerkop nest for years. The African Wattled Lapwing* is often seen at the weir, walking slowly and deliberately along the sandbanks, often pausing with one leg raised as it searches for prey. Biyamiti Loop (S23) is a recommended detour along this road. The 16km road follows the river before rejoining the S114 via the S23 at Muhlambamadvube Water Hole. Cheetahs are sometimes seen along this road, which has good views across the river into the grassland, woodlands and thorn thickets. One of South Africa's rarer cuckoos, the Levaillant's Cuckoo* is sometimes seen here. It is one of the few cuckoos that breed in Kruger. The bird gets its name from Francois Le Vaillant, a French scientist who personally named about 150 new species during his excursion to southern Africa between 1780 and 1785. Between Biyamiti Loop (S23) and the Shirimantanga Koppies are rolling mixed bushwillow woodlands. 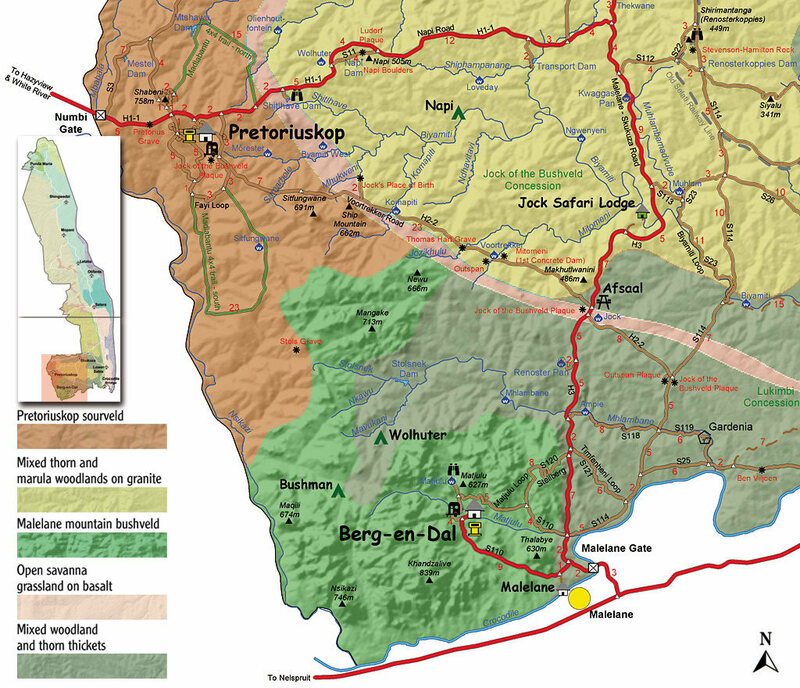 Here the S114 is joined by the Bume River Road (S26) and Randspruit Roads (H5) (see pages 81 and 82). An alternative, longer detour to Skukuza is the N'watimhiri Road (S21). This passes Siyalu Hill (341m) and a series of pans on the N'watimhiri Stream and joins up with the Lower Sabie road south of Nkuhlu Picnic Spot. The bush shifts from mixed woodland to thorn thicket the closer one gets to Skukuza. Shirimantanga Koppies and Renosterkoppies Water Hole are recommended stopping points. The Shangaan proverb, 'When the Honeyguide sings, whistle', means 'follow the one who calls you, he will bring you good fortune'. Honeyguides, (nhlalala in Shangaan), have long been viewed as a point of connection with the supernatural. That's because of the bird's rumoured habit of guiding humans to honey, a behaviour that appears to be inherited rather than learnt. Many traditional belief systems hold that should the ancestors decree, the Honeyguide will lead a person to great fortune. On the other hand, the bird will lead wrong-doers to their deaths in the bush - for instance, into a pride of lions or to a poisonous snake. The Honeyguide is reputed to use humans to do the tough work of getting the honey. This has never been scientifically proved, but there are anecdotal stories about how the bird catches human attention by conspicuous chattering and perching and then beckoning in a certain direction by flying backwards and forwards along that path. Inevitably, the walk will lead to a hive of bees. The Honeyguide then waits for its human helpers to smoke out the bees and break the hive open. The human reward is the honey while the bird feasts on its favourite delicacy - beeswax - as well as eggs and larvae. No other bird eats wax but Honeyguides can virtually live on the stuff. Roberts VII records a case of a Greater Honeyguide that lived purely off beeswax for almost a month. This love of wax was recorded by a Dominican missionary in Mozambique in the 16th century who observed honeyguides flying into the church to peck at the altar candles. Honeyguides also have a symbiotic relationship with honey badgers, alternatively following them or leading them to bees' nests. The most common species in Kruger is the Greater Honeyguide which has a noticeable, sharp, pink bill, a black throat stripe and white ear patches. It is the most distinctive Honeyguide in the Park. The others are the Lesser and Scaly-throated Honeyguides. Like cuckoos, the Greater Honeyguide lays its eggs in the nests of other birds for them to raise its chicks. It parasitises the Golden-tailed, Cardinal and Olive Woodpeckers, as well as the Black-collared Barbet. Shirimantanga is the final resting place of James Stevenson-Hamilton. The mournful call of the Emerald-spotted Wood-Dove echoes through the giant granite boulders, contrasting with the lighter, cheerier melody of the Mocking Cliff-Chat* which sings as it hops around the rocks and trees. Both Red-billed and Southern Yellow-billed Hornbills are to be found around these koppies while the Brown Snake-Eagle may be seen perched in the larger woodland trees looking out for snakes, lizards and chameleons. Its legs are densely scaled, which protects it - to some degree - against snake bite. According to the researcher J van Warmelo, Shirimantanga was a Shangaan chief who lived here at some point in the distant past. The meaning of his name is the 'tiller of the early garden in damp soil'. See The Central - South Road to Skukuza and Mathekanyane and Renosterkoppies. The Black-bellied Bustard* (Xicololwana lexi kulu in Shangaan) has the strangest of calls. The large, long-legged grassland bird extends its neck, puffs out its throat feathers, fluffs its wings, and issues a frog-like croak before abruptly pulling its head back onto its shoulders and making the sound of a cork being pulled from a bottle. It also performs aerial courtship displays in which it coasts along with its wings rigidly upheld, its neck arched and its throat puffed out. 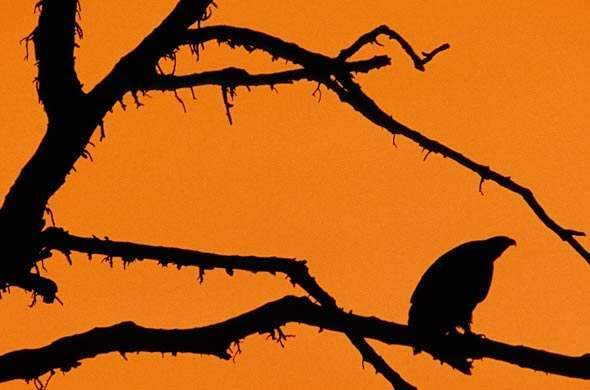 Leopards and Martial Eagles are among its main predators. The Kruger Park is the main sanctuary for the Black-bellied Bustard*, which has a near threatened status in South Africa because of habitat destruction outside of conservation areas.